Yesterday was Batman Day (third annual). Today is Bill Finger Day—one year since he got official credit. 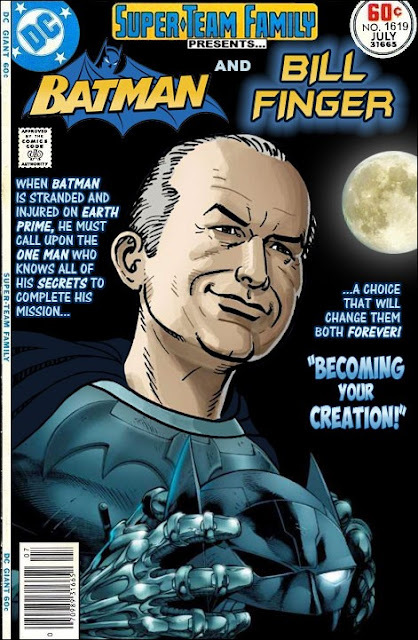 To paraphrase Bill the Boy Wonder: The Secret Co-Creator of Batman, this Bill is no longer past due. It has been an exhilarating and sometimes bewildering 365 days. Thank you to Ross Pearsall at Super-Team Family: The Lost Issues for helping me mark this first anniversary in such a memorable way. 9/19/16 addendum from Ross: "The cover has been up only a day and stats indicate it is already the second-most-clicked [behind a Justice League of America/Spider-Man cover that was used in a YouTube video] in the blog's history."